In this world of mine there is something always new, fancier or trendier than the thing behind. Being a person who gets bored easily, this could be heaven on earth. Sometimes is a new food that you have never heard about. Maybe is the latest methodology on how to teach your kid math or science. It keeps you going and always longing for the next thing to come. My excitement is always up. Nevertheless, I still could recognize when everything around is daring my attention spam. That is the moment when I crave for simple and uncomplicated. Essential if I must say. Those things warm your soul and make you pause, like your own emotional oasis. You need to have these things under your arm all the time, so you can reach for them in the midst of anything. That’s why I wanted to share with you my super simple pancakes recipe. They’re our anchor pancakes, just a good warm comfort breakfast. 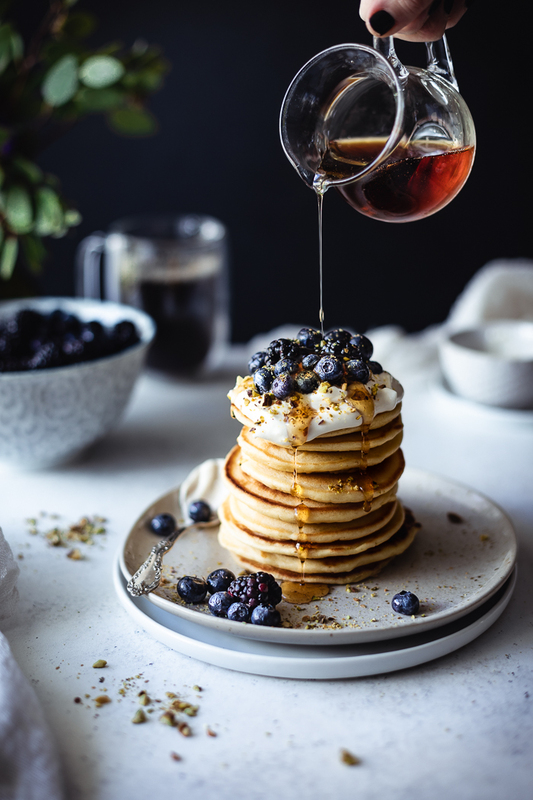 Swirling around pancakes with different kinds of flours, techniques, additions to the batter, fats and everything in between, these are just some happy, simple and delicious pancakes that you can always count on. If you follow my Instagram you know that I have experimented with my pancakes like crazy. But then it occurred to me that I haven’t officially shared the recipe of our favorite Sunday breakfast so far. I wanted then to start with a recipe you could make your own with whatever your cooking mood is at the moment. You can make your own creation by adding cinnamon and ginger, chia seeds, chopped nuts, almond or coconut extract, chocolate chips or, my personal favorite, an ounce of softened cream cheese that basically melts on the batter. And you can serve them with a world of fixings too. Nutella, cream cheese and jelly, any nut butter and jelly, Greek yogurt sweetened with some honey or maple syrup, and the list could go on!!! We also love to have this fruit salad made with lemon juice and sugar on the side (or on top really). The fruit becomes sweet and soft but still with that acidity and bite on the inside. It’s truly delicious and I hope you make it because it’s going to be a favorite of yours. We love it inside a big Dutch baby too!! Are there any other things to put on pancakes that I’m missing out? 1. Almond flour is completely optional; you may use all purpose flour instead. I just like the idea of the added fiber and protein. 2. Separating the eggs is an idea to add more fluffiness to your pancakes but completely optional as well. When you have the time or energy do it! When you don’t, just drop the whole 2 eggs in the liquid mixture. 3. Have you heard that the first batch of pancakes are not the best because your’e still working on the pan heat? Don’t waste a batch! When you think the pan is ready just pour a small amount of batter in the center of the pan. If it takes too long then you know you will have to wait a minute more and would be able to cook on medium heat for the first couple of batches. In the middle of cooking you probably will have to lower the heat to medium high. 4. For pancakes leftover, place them in a flat surface (tray or plastic plate) without overlapping them too much and freeze them for a couple of hours or until the next day, then store them in freezer plastic bags. To make the pancakes: In a bowl or a large measuring cup mix the coconut milk and the lemon juice. You should have a total of 1 ½ cup of liquid. In a large bowl combine the flour, almond flour and the baking soda with a hand whisk. In a medium glass bowl melt the butter in 10 second intervals. Immediately add the sugar and using a hand whisk mix to dissolve the sugar into the butter. Add the vanilla and salt and mix once more. Add the eggs or egg yolks if you decided to whip the whites and mix. Beat the eggs vigorously with the whisk to make them smooth. Add the coconut milk mixture and mix until everything is well incorporated. If you separated the eggs, beat in medium high speed the egg whites either with a stand mixer or an electric hand mixer with the whisk attachment just until soft peaks form. Set aside. Add half of the flour mixture into the liquid mixture and gently mix until most of the flour is incorporated. Add the rest of the flour and mix once more. Remember that small lumps of flour are ok. If using egg whites, pour half of them in the batter and, using a wooden spoon, gently fold them in with a scooping motion from the center out and back to the center. Rotate the bowl and repeat until they are almost folded in. Incorporate the rest of the whites by repeating the process. Heat a griddle in medium heat and melt some butter on it, just to cover the surface. Don't let the butter brown. Using a spatula spread the melted butter. After a couple of minutes of heating, pour about ¼ cup of the batter on the hot griddle. Cook for about 2 1/3 to 3 minutes, until the edges look dry and have tiny bubbles. Carefully turn the pancakes over and cook for an extra minute. Retire form heat. Spread some more butter if desired. Repeat with the rest of the batter. If they are burning too fast just drop the heat for a few minutes for the next batch and when you feel the heat is controlled turn it up again to medium. Feel free to play with it as you go. Serve them with warm maple syrup, fruits, nuts, cream cheese, whipped cream, Nutella or any other fixing you may think is appropriate for a Sunday breakfast! To make the Berry Lemon Salad: Mix all the ingredients in a bowl. Let the fruit rest at least 20 to 30 minutes before serving.